1855 Colton Map of Washington D.C.
Colton's Georgetown and the City of Washington The Capital of the United States of America. 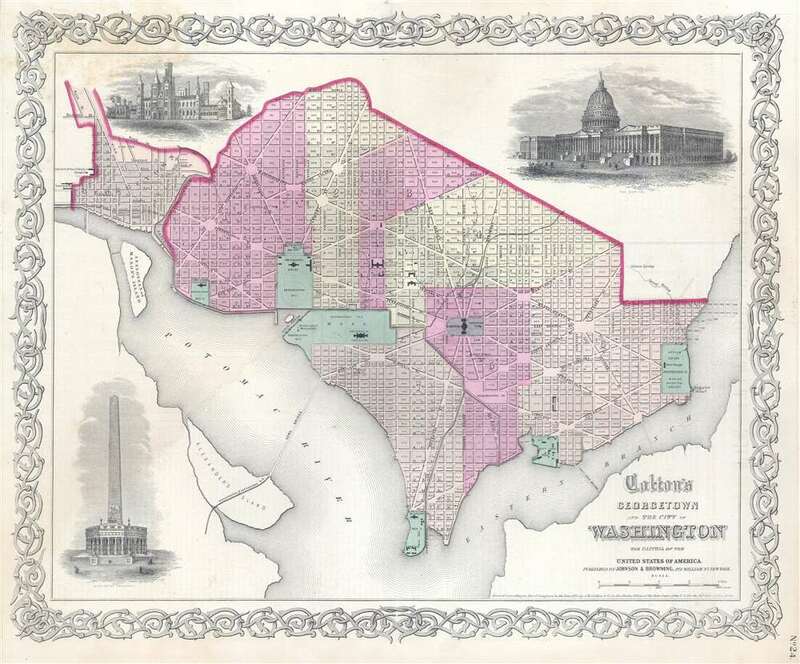 A very attractive example of Colton's 1855 Map of Washington D.C. and Georgetown. Covers the city in incredible detain from Georgetown (Georgetown University, then college shown) in the upper left quadrant to Alexander's Island in the south and as far east as Magazine Warf. Individual buildings such as the Smithsonian, the White House, the Capitol, the Arsenal, Penitentiary, Naval Yard, Poor House, Asylum, and Post office are all indicated. Features three inset engravings: The Smithsonian Institution, the Capitol, and a presumptive Washington Monument. Prepared by J. H. Colton and Company for issue as plate no. 24 in 'Colton's General Atlas.' Title bears the Johnson and Browning imprint, suggesting that this is an 1860 or 1861 issue of the map despite the 1855 copyright. Very good condition. Light water stain upper left quadrant. Else clean. Blank on verso.